Long-term studies of secondary succession and community assembly in the prairie-forest ecotone of eastern Kansas. Local and regional-scale processes interact to govern the assembly, diversity and functioning of ecological communities. Evaluating the interplay of these differently-scaled processes in the regulation of ecological systems is a challenging problem, but is crucial towards understanding and predicting the potential effects of accelerated human activity on biological diversity and ecosystem sustainability. 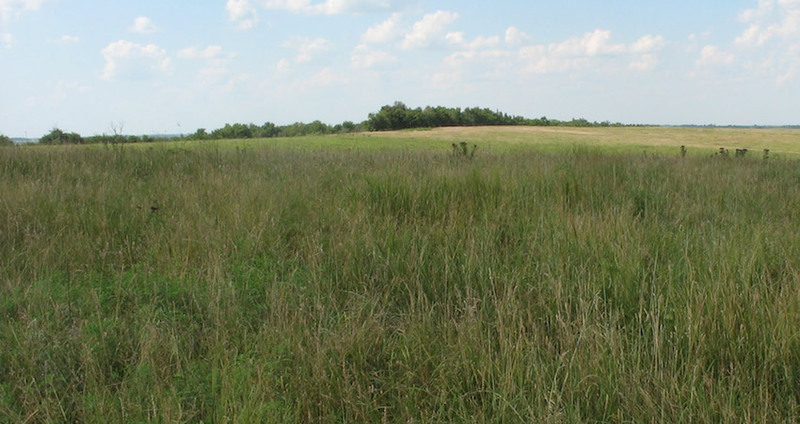 Since 2000, two long-term field experiments have been underway in grasslands of eastern Kansas to investigate the interplay of soil resource availability, species interactions and regional processes governing plant secondary succession, community assembly, biodiversity, and ecosystem functioning. Both experiments involve manipulations of soil nutrients in permanent grassland study plots and employ multi-species seed addition treatments to evaluate the contribution of dispersal limitation and regional constraints on local species pools to the regulation of plant community dynamics. Our long-term field studies are conducted at the University of Kansas Field Station (KUFS) located in eastern Kansas in the prairie-forest ecotone region of the central USA. KUFS and is located just north of Lawrence, Kansas. Historically, the area was dominated by tall-grass prairie and savanna vegetation prior to settlement. Experiments 1 and 2 were established in a 20+ hectare former cool-season hay field that had been maintained as grassland by periodic mowing since abandonment from hay production in the early 1980’s. At the start of our studies in 2000, the field was dominated by introduced C3 hay-grasses, Bromus inermis (Smooth Brome) and Schedonorus arundinaceus (Tall Fescue). Experiment 1 (Old-field succession experiment), previously funded by the National Science Foundation, was initiated in 2001 in a section of the abandoned hay field that was sprayed with herbicide, plowed and disked prior to the start of the study to investigate plant community dynamics in the context of old-field succession initiated on bare soil. The experimental design involves factorial experimental gradients of nitrogen (N) supply (four levels of N fertilization), phosphorus (P) supply (two levels of P fertilization) and plant propagule input achieved by adding seeds of 50+ native and naturalized species to half of the study plots. With annual sampling this experiment allows us to examine old-field succession and community assembly unfolding along gradients of N and P fertilization and under conditions of ambient and experimentally-enriched species pools. Experiment 2 (Hay meadow restoration experiment), previously funded by USDA, was established in 2000 in a section of the field that was left unplowed at the start of the experiment. Thus Experiment 2 was initiated in the context of secondary succession on recently abandoned cool-season hayfield where hay grass species were dominant at the start of the study. In this experiment we have been monitoring plant community change annually since 2001 in response to two aspects of hay management important in our area: annual fertilization and annual haying. 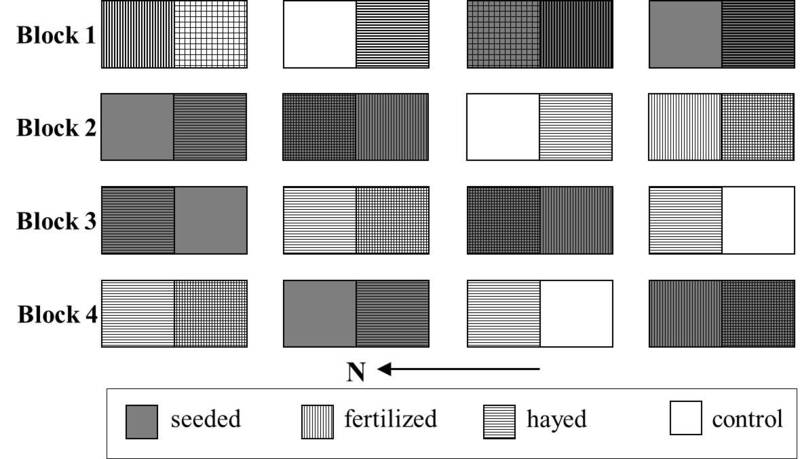 The experimental design involves factorial manipulations of nutrient supply (two levels of NPK fertilization), annual haying (two levels: hayed; not hayed) and propagule input achieved by adding seeds of 41 native prairie species to half of the plots. Experiment 2 parallels Experiment 1 with manipulations of soil resources and species pools, but does so in the contexts of hay management and native prairie hay meadow restoration. These core experiments, and a number of associated auxiliary studies conducted at the same site by graduate students, postdocs and other collaborators, have allowed us to address a wide array of questions in community ecology that can be organized conceptually into five interrelated research themes:1) species coexistence and biodiversity; 2) patterns and mechanisms of succession; 3) communty assembly and meta-community dynamics; 4) linkages between community structure and ecosystem function; 5) grassland restoration and management. In preparation for experiment 1 a 70 x 120 m rectangular area of the field was sprayed with glyphosate herbicide summer 2000 and then plowed and disked March-April 2001. In mid-April 2001 we established 96 4 x 5 m experimental plots, laid out in a 12 x 8 plot grid (Fig 1). The plot array was divided into 6 rectangular blocks of 16 plots, arranged to control for spatial effects associated with a slight field slope. Each block was further divided into two clusters of 8 plots. 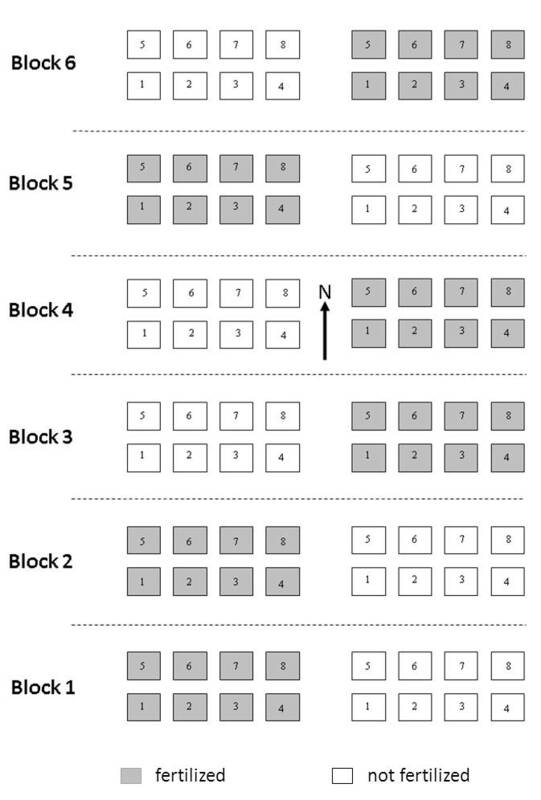 Blocks were separated by 12 m buffers, clusters nested within blocks were separated by 10 m buffers, and plots nested within clusters were separated by 2 m buffers. To the array of plots we applied 16 unique treatment combinations (n = 6) in a 4 x 2 x 2 factorial nested design. Nested in each cluster of each block, the first two factors were fully crossed in a 4 x 2 configuration: nitrogen (N) fertilizer added to plots as ammonium-nitrate at four levels (0, 4, 8 and 16 g N m-2 yr-1); and phosphorus (P) added as superphosphate at two levels (0 and 8 g P m-2 yr-1). In each block, one of the two clusters of eight plots was randomly selected to receive multi-species seed additions (sowing treatment) to experimentally enhance the pool of species available to plots. To accomplish sowing, seeds of 50+ native and naturalized species were sown in April 2002 and 2003. All sown species are members of the regional pool, chosen to represent a range of life histories, functional guilds, historical origins and habitat affinities. Seeds were sown at rates ranging from 10-320 seeds m-2 yr-1 year; depending on availability. To maintain plots as grassland, a schedule of spring prescribed burns was initiated in 2005 on a return frequency of once every three years. Core data for Experiment 1 consists of plant species % cover and plant biomass data collected during annual vegetation surveys/harvests of all experiment plots. The annual core data time-series currently spans 2001-2015. Percent cover - Cover surveys of vegetation are conducted annually in late June - early July by taking ocular estimates of percent cover for each species rooted within in two permanently-marked 1 x 1 m sampling quadrats in each plot (192 quadrats in all). Plant biomass - Biomass harvests of all plots are conducted annually in mid-late July. From each plot, one 0.1 x 2 m strip of aboveground plant material is harvested with electric clippers. Biomass is clipped at ground level and all litter collected. Samples are separated into live and litter fractions. All biomass fractions are dried to constant mass at 70˚C in a forced-air oven and then weighed. In March of 2000 we established a 4 x 4 grid of 16, 10 x 20 m plots at the site (Fig 2). Plots were separated by 3 m buffer strips. Each 10 x 20 m plot was divided into two contiguous 10 x 10 m subplots (yielding a total of 32 subplots). A 2 x 2 x 2 factorial set of treatments was assigned to the plots and subplots in a split-plot design: two levels of nutrient fertilization (fertilized; not fertilized) applied as the whole-plot factor; two levels of native prairie seed sowing (seed of 41 species sown; seed not sown) applied as a whole plot factor, and two levels of haying (hayed; not hayed) applied as the split-plot factor. There are four replicates of each treatment combination. NPK fertilizer (29-3-4) was spread by hand to each 10 x 20 m whole-plot at a rate of 14-16 g N m-2 per year. This application rate is at the high end of what is typically applied to production cool season hayfields of the region. From 2002 to 2006, one subplot in each whole plot was hayed annually in mid-June as is typical for the cool-season hayfields of the region. In 2007 we decided to alter haying management in the non-fertilized plots by shifting the time of haying to late July - early August, the typical time of harvest for native warm-season hay meadows in our area. This was done because although fertilized plots remain dominated by cool-season grasses, non-fertilized plots have shifted to dominance by warm-season grasses. Since 2008 we have maintained haying treatments in the following way: fertilized plots hayed in June, typical for cool-season hay fields; non-fertilized plots hayed in late July - early August in accordance with native hay meadow management. Seeds of 41 native prairie species, common to nearby native prairie and prairie hay meadows, were sown by hand into 8 of the 16 whole-plots in February of 2003 and 2004 at an average rate of 47 seeds per m2 for each species. Core data for Experiment 2 consists of plant species biomass and % cover data collected annually in all subplots. Plant biomass – Each year we sample aboveground biomass in all subplots, just prior to mid-June haying when cool-season grasslands are at peak production. Beginning in 2007, after shifting the haying time for the non-fertilized plots to late summer, we initiated a second round of annual biomass sampling in some years in late July, just prior to late summer haying to better estimate plant production and hay yields in the non-fertilized plots that are now dominated by warm-season grasses. To sample biomass, two 0.1 x 2 m strips of aboveground plant material are harvested in each subplot with electric clippers. Biomass is clipped at ground level and all litter collected. Samples are separated into live and litter fractions, with the live fraction sorted to species. Percent cover – Prior to 2010 cover surveys are conducted in the central 8 x 8 m area of each 10 x 10 m subplot to capture dominant plant composition at a larger scale than assessed by biomass samples. From 2010 onward we have conducted cover surveys in each subplot within 3-6 six 1 x 1 m quadrats. These smaller cover quadrats support tests of hypotheses 6 and 7 regarding spatial turnover and community dispersion as discussed above. Conventionally, community ecologists have viewed species coexistence and diversity at the local scale as being strongly dependent on niche availability as determined by underlying ecosystem properties (abiotic conditions, resource availability, productivity), biotic interactions and disturbances resolved at the scale of the local habitat (Tilman 1988; Huston 1994; Grace 1999). However, work over the last two decades has re-focused attention on the role of regional phenomena, species pools and dispersal limitations as important mediators of local community assembly and diversity (Ricklefs 1987; Taylor et al. 1990; Eriksson 1993; Huston 1999; Xiong et al. 2003, Foster et al 2004). The emergence of neutral theory and the recognition that many communities may be unsaturated with species, such that their diversity is strongly constrained by species pools and limits to immigration, has caused many to question the primacy of resource competition and niche relations in determining limits to species diversity (Cornell & Lawton 1992; Pärtel et al. 1996; Zobel 2001; Hubble 2005). Recent theoretical work on meta-communities has highlighted the combined importance of regional pools, dispersal among localities, habitat connectivity, stochasticity and niche-based ecological determinism in regulating coexistence (Leibold et al. 2004; Cottenie 2005). By experimentally relaxing dispersal constraints and enhancing species access to plots we conduct tests of community saturation nd evaluate the extent to which the diversity of a community is limited by the availability of species. A broad objective of our research is to examine the relative contribution of local and regional processes in the regulation of plant diversity along gradients of soil fertility and productivity. Numerous hypotheses have been put forward to explain the diversity-productivity relationship for plant communities, which is often found to be unimodal (Grime 1979; Tilman and Pacala 1993; Grace 1999; Huston 1999). Our core field experiments allow us to evaluate three general hypotheses useful for distinguishing possible roles of species pools and dispersal limitation in constraining local diversity. Together, these general hypotheses encompass many of the more specific hypotheses that have been discussed in the literature (Grace 1999). H1: The Niche Limitation Hypothesis (NLH) assumes that richness along a productivity gradient is limited by local processes such as species interactions, microsite availability, or more generally, niche availability. The NLH is represented by equilibrium models of coexistence such as the resource-ratio hypothesis (Tilman 1982) and variations of the resource-ratio hypothesis that incorporate resource heterogeneity (Tilman & Pacala 1993). These models do not consider the possibility of limitation by species availability and thus implicitly assume infinite species pools. H2: The Species Pool Hypothesis (SPH), in the form we present it, stems from Taylor et al. (1990), Eriksson (1993) and Zobel (1997) and provides an extreme alternative to the NLH. The SPH explains patterns of local richness along entire gradients of productivity as a consequence of constraints imposed by regional species pools. In a strict interpretation of the SPH, local ecological processes and niche availability do not limit richness at any position along a gradient. In the case of the unimodal diversity productivity relationship, the SPH assumes that richness of the regional species pool is unimodal and that local-scale unimodal richness patterns simply reflect proportional sampling of the regional pool. Of particular relevance to our study, the SPH interprets declines in species richness in response to eutrophication as a simple consequence of species pool exhaustion. H3: The Shifting Limitations Hypothesis (SLH) contains elements of the NLH and the SPH and incorporates equilibrium and nonequilibrium perspectives. Models of community organization by Grime (1979) and Huston (1999) suggest that the role of regional species pools in limiting local richness should be greatest at moderate productivity, but decline in importance at high productivity due to the increasing relevance of competitive exclusion. We refer to this model as the shifting limitations hypothesis because it predicts shifts in the relative importance of local vs. regional control of diversity along productivity gradients. Renewed interest in succession has been stimulated by advancements in community assembly theory and its application to restoration, and concerns about the effects of global change on ecosystem dynamics (Young et al. 2005; Hobbs et al 2007). Experiments 1 and 2 are valuable studies of succession because they are conducted at the same location on the same soil type and with similar experimental manipulations, yet with contrasting initial conditions and applied contexts. These studies have already yielded important insights into the patterns and mechanisms of ecosystem recovery expected following agricultural abandonment in our region (Tiemann and Billings 2008, Foster 2009, Foster et al. in review, PNAS). These experiments also compliment another long-term study of succession initiated at our field station in 1984 that examined effects of habitat fragmentation on secondary succession (Holt et al. 1995; Cook et al. 2005). Together, these studies represent a significant resource at KU for addressing variety of questions about succession and ecosystem re-assembly in response to global change factors (habitat eutrophication, habitat fragmentation, land-use change and regional species loss). Although the other research themes in this proposal relate to succession, we briefly discuss the application of Experiments 1 and 2 towards understanding basic mechanisms of successional turnover. Because succession involves the interplay of species arrival, colonization, site modification and subsequent competitive exclusion and extinction (Connell and Slatyer 1977; Huston and Smith 1987; Pickett et. al 1987), rates and trajectories of succession should be sensitive to variations in species availability and resource supply (Grime 1979; Huston 1979; Inouye and Tilman 1995). By adding seeds of early, mid and late successional species at the initiation of succession we assess dynamics unfolding under varied levels of species availability and resource limitation. Seed additions permit the inspection of succession driven primarily by species interactions and differences in life history/competitive traits of species present. Our experiments then allow us to evaluate classic models of succession such as Egler’s Initial Florsitics Model (Egler 1954) and the Competition-colonization Tradeoff Model (Tilman 1990; Pacala and Rees 1998). An overarching hypothesis guiding our investigations of succession is that dispersal limitation, soil fertility and interactions between the two act to constrain rates and trajectories of successional turnover . Although the concept of succession rate is fundamental to the study of community dynamics (Shugart and Hett 1973; Bonikamm 198; Foster and Tilman 2000), the assessment of succession rate may depend on the metric used (Lewis 1978; Myster and Pickett 1994; Foster and Tilman 2000) and the time span over which dynamics are viewed (Shugart and Hett 1973; Foster and Tilman 2000). In addition to assessments of succession rate, we are also investigating trajectories of change. By trajectory we refer to the series of compositional states exhibited by a community at different points in time. This topic overlaps with the theme of community assembly and meta-community dynamics below, so we reserve that topic for the next section. We have recently begun using our experiments to evaluate concepts of community assembly emerging from metacommunity theory (Leibold et al. 2004; Leibold and Norberg 2004, Cottenie 2005), particularly with respect to processes generating variation in trajectories of community development and composition among localities (i.e. spatial community turnover, community dispersion). Metacommunity theory assumes that differences in composition among localities will emerge as a result of: 1) niche-based species sorting driven by variation in environmental conditions and species differences in niche requirements; and 2) habitat connectivity and dispersal between localities. According to meta-community theory, the contribution of species sorting to community variation, and thus the degree to which environmental gradients become expressed in the community, should be most evident in landscapes where habitat connectivity and dispersal are sufficient to assure that suitable species are available to colonize, compete and sort into in their preferred sites. Following meta-community theory we hypothesize that species sorting and community differentiation along soil resource gradients will increase over successional time as communities develop and will become more attuned under conditions of enhanced species availability. We evaluate additional hypotheses emerging from the meta-community perspective and from theoretical studies of community assembly regarding the potential influence of initial community states on subsequent community assembly. One hypothesis states that all else being equal, community dispersion among sites of similar environmental condition should be greatest where habitat connectivity and dispersal are low. When meta-community connectivity is low and dispersal among localities is unpredictable, it follows that spatial variation in initial composition, colonization history and subsequent patterns of community assembly will be greater than across meta-communities characterized by high connectivity and predictable dispersal. Initial differences in composition resulting from unpredictable dispersal may also increase opportunities for priority effects driving community divergence into alternative stable states (Chase 2003). In addition, all else being equal, community dispersion should be greater among sites located in productive environments than among sites located in unproductive environments. This prediction stems from theoretical studies suggesting that the contribution of colonization history and priority effects to long-term community assembly, and thus the propensity of environmentally-similar sites to diverge into alternative states, should be greatest in resource-rich and productive sites of low environmental stress (Chase 2003, Fukami and Lee 2006, Houseman et al. 2008). This is particularly likely in highly fertile plant communities where resource preemption and asymmetric competition for light may favor persistence of the initial dominant species. An additional objective has been to examine effects on ecosystem processes, particularly plant productivity, and to explore linkages between regional processes, local community structure nd ecosystem functioning. As in many systems, primary production is strongly limited by soil N at our site (Dickson and Foster et al. 2008). However, we hypothesize that although soil resources determine the maximum potential productivity of a local community, factors extrinsic to soil resources that influence species diversity and composition govern the extent to which this potential is realized. If this is true, variation in community membership among localities that emerges independent from the selective effects of resource availability (via species pool constraints, stochastic dispersal and establishment) should have consequences at the ecosystem level by affecting how many and which species are available to translate local resources into production. Although our experiments address a range of questions in community ecology, they also address applied issues in the realms of restoration and management. The sowing treatments in both experiments mimic restorations conducted in the region via prairie seed additions to abandoned agricultural lands previously occupied by prairie (Kettle et al. 2000; Kindscher and Fraser 2000). Experiment 2 was explicitly designed to evaluate effects of hay management on grassland composition, hay yield, and potential for conversion of High Input, Low Diversity (HILD) grasslands to Low Input, High Diversity (LIHD) native hay meadows (Foster et al. 2009). At the start of the project, we hypothesized that the effectiveness of native seed sowing in prairie restoration would be greatest at low N fertility and in the presence of annual haying. Haddad, N.M.et al. 2014. 2015. Habitat fragmentation and its lasting impact on Earth’s ecosystems. Science Advances 1, e1500052. Long, Q., B. L. Foster and K. Kindscher. 2014. Seed and microsite limitations mediate stochastic recruitment in a low-diversity prairie restoration. Plant Ecology 15:1287-1298. Murphy, C. A. and B. L. Foster. 2014. Soil properties and spatial processes influence bacterial metacommunities within a grassland restoration experiment. Restoration Ecology 22:685-691. Bonikamm, R. 1981. Rates of change in vegetation during secondary succession. Vegetatio 47:213-220. Chase, J. 2003. Community assembly: when should history matter. Oecologia 136:489-498. Connell, J. H. and R. O. Slatyer. 1977. Mechanisms of sucession in natural communities and their role in community stability and organization. American Naturalist 111:1119- 1144. Cornell, H. V. and J. H. Lawton. 1992. Species interactions, local and regional processes, and limits to the richness of ecological communities: a theoretical perspective. Journal of Animal Ecology 61:1-12. Dickson, T. L. 2006. Species richness and composition: the varying importance of plant colonization along resource gradients. Ph.D. Dissertation. University of Kansas, Lawrence Kansas. Egler, F. E. 1954. Vegetation science concepts. I. initial floristic composition, a factor in old-field development. Vegetatio 14. Eriksson, O. 1993. The species pool hypothesis and plant community diversity. Oikos 68:371-374. Foster. B. L. K. Kindscher, G. R. Houseman and C.A. Murphy. 2009. Effects of hay management and native species sowing on grassland community structure, biomass and restoration. Ecological Applications (pdf). Fukami, T. and W. G. Lee. 2006. Alternative stable states, trait dispersion and ecological restoration. Oikos 113:357-362. Grace, J. B. 1999. The factors controlling species density in herbaceous plant communities: an assessment. Perspectives in Plant Ecology, Evolution and Systematics 2:1-28. Grime, J. P. 1979. Plant Strategies and Vegetation Processes. Wiley, New York. Hobbs, R., A. Jentsch, and V. Temperton. 2007. Restoration as a Process of Assembly and Succession Mediated by Disturbance. Pages 150-167 in J. Walker, R. delMoral, L. Walker, and R. Hobbs, editors. Springer, New York. Houseman, G. R., G. G. Mittelbach, H. L. Reynolds, and K. L. Gross. 2008. Perturbations alter community convergence, divergence, and formation of multiple community states. Ecology 89:2172-2180. Hubbell, S. 2005. Neutral theory in community ecology and the hypothesis of functional equivalence. Functional Ecology 19:166-172. Huston, M. 1979. A general hypothesis of species diversity. The American Naturalist 113:81-101. Huston, M. A. 1994. Biological Diversity. Cambridge University Press, Cambridge. Huston, M. A. 1999. Local processes and regional patterns: appropriate scales for understanding variation in the diversity of plants and animals. Oikos 86:3393-3401. Huston, M. and T. Smith. 1987. Plant succession: life history and competition. American Naturalist 130:168-198. Inouye, R. and D. Tilman. 1995. Convergence and divergence of old-field vegetation after 11 yr of nitrogen addition. Ecology 76:1872-1887. Kettle, W. D., P. M. Rich, K. Kindscher, G. L. Pittman, and P. Fu. 2000. Land-use history in ecosystem restoration: a 40-year study in the prairie-forest ecotone. Restoration Ecology 8:307-317. Khavin, I. S. 2008. Arthropod and plant responses to resource availability and heterogeneity. M.A. Thesis. University of Kansas, Lawrence Kansas. Kincaid, P., V. H. Smith, B.L. Foster, J.L. Madden 2002. Effects of phosphorus and nitrogen manipulations on tallgrass prairie restoration. National Nursery Proceedings, Ogden, Utah: USDA Forest Service, Rocky Mt. Research Station. Kindscher, K. and A. Fraser. 2000. diversity in Tallgrass Prairie Restorations Ecological Restoration 18:115-116. Ecological Restoration 18:115-116. Lamond, R. E., J. O. Fritz, and P. D. Ohlenbusch. 1992. Smooth Brome production and utilization. Report. Kansas State University Agricultural Experiment Station and Cooperative Extension Service. Leibold, M. A. and J. Norberg. 2004. Biodiversity in metacommunities: plankton as complex adaptive systems? Limnology and Oceanography 49:1278-1289. Leibold, M. A., M. Holyoak, N. Mouquet, P. Amarasekare, J. M. Chase, M. F. Hoopes, R. D. Holt, J. B. Shurin, R. Law, D. Tilman, M. Loreau, and A. Gonzale. 2004. The metacommunity concept: a framework for multi-scale community ecology. Ecology Letters 7:601-613. Lewis, W. M. 1978. Analysis of succession in a tropical phytoplankton community and a new measure of succession rate. American Naturalist 112:401-414. Loreau, M., S. Naeem, and P. Inchausti, editors. 2002. Biodiversity and Ecosystem Functioning. Oxford University Press, New York. Myster, R. W. and S. T. A. Pickett. 1994. A comparison of rate of succession over 18 yr in 10 contrasting old fields. Ecology 75:387-392. Pacala, S. W. and M. Rees. 1998. Models suggesting field experiments to test two hypotheses explaining successional diversity. American Naturalist 152:729-737. Pärtel, M., M. Zobel, K. Zobel, and E. Van der Maarel. 1996. The species pool and its relation to species richness: evidence from Estonian plant communities. Oikos 75:111-117. Pickett, S. T. A., S. L. Collins, and J. J. Armesto. 1987. Models, Mechanisms and Pathways of Succession. The Botanical Review 53:335-371. Ricklefs, R. E. 1987. Community diversity: relative roles of local and regional processes. Science 235:167-171. Shugart, H. H. and J. M. Hett. 1973. Succession: similarities of species turnover rates. Science 180:1379-1381. Taylor, D. R., L. W. Aarssen, and C. Loehle. 1990. On the relationship between r/k selection and environmental carrying capacity: a new habitat template for plant life history strategies. Oikos 58:239-250. Tiemann, L. K. and S. A. Billings. 2008. Carbon controls on nitrous oxide production with changes in substrate availability in a North American grassland Soil Science Society of America Journal 173:332-341. Tilman, D. 1982. Resource Competition and Community Structure. Princeton University Press, Princeton, New Jersey. Tilman, D. 1988. Plant Strategies and the Dynamics and Structure of Plant Communities. Princeton University Press, Princeton, N.J.
Tilman, D. 1990. Constraints and tradeoffs: toward a predictive theory of competition and succession. Oikos 58:3-15. Tilman, D. and S. Pacala. 1993. The maintenance of species richness in plant communities. Pages 13-25 in R. E. Ricklefs and D. Schluter, editors. Species Diversity in Ecological Communities. University of Chicago Press, Chicago. Tilman, D., P. B. Reich, J. Knops, D. Wedin, T. Mielke, and C. Lehman. 2001. Diversity and productivity in a long-term grassland experiment. Science 294:843-845. Xiong, S., M. E. Johansson, F. M. R. Hughes, A. Hayes, K. S. Richards, and C. Nilsson. 2003. Interactive effects of soil moisture, vegetation canopy, plant litter and seed addition on plant diversity in a wetland community. Journal of Ecology 91:976-986. Young, T. P., D. A. Peterson, and J. J. Clay. 2005. The ecology of restoration: historical links, emerging issues and unexplored realms. Ecology Letters 8. Zar, J. H. 1999. Biostatistical Analysis. Prentice-Hall, Inc., Upper Saddle River, New Jersey. Zobel, M. 1997. The relative role of species pools in determining plant species richness: an alternative explanation of species coexistence. Trends in Ecology and Evolution 12:266-269. Zobel, K. 2001. On the species-pool hypothesis and on the quasi-neutral concept of plant community diversity. Folia Geobotanica 36:3-8.